She announces that at lunch as she munches on some strawberries. I lean in close, thinking I misheard. We were, after all, sharing this deep, meaningful moment in a crowded school cafeteria with the background noise of about 80 other second graders. Who has ever called her this or slammed this ill-fitting and utterly cruel label onto this beautiful and loved daughter of mine? Like an over-sized dunce cap on a child in the corner, this identity reeks of shame. I wait for her to identify the name-caller, the bully that’s been filling her head with these lies. Surely, it’s not me. I review seven years of my Mom-speeches and Mom-conversations to see if I’m the culprit. It’s little more than a logic exercise for her as she shrugs her shoulders and delivers the explanation all matter-of-fact and void of any emotion. This is the internal dialogue she’s been having, the way she has accused herself, identified herself, classified and labeled herself, gathered the evidence and declared herself guilty all on her own. What’s a mom to say? I feel the pressure of a moment, how to explain love, grace, discipline, and salvation all right then and there as she unwraps her granola bar? But I can’t. I can only start the dialogue, open it up right there and begin the surgery, then return to that wound over and over to clean out the infection, the festering pus of lies, until she’s healed and whole. No more calling yourself “The Bad One.” You are loved, totally loved, no more or less than any other member of this family. You sin. We all sin. You need to be disciplined sometimes. We all do. But Mom and Dad always, always love you. I consider the self-condemning lies and slander I fill my own head with and I think about the whispered and anguished confessions of my friends struggling with their own self-hatred. Christ offers us the freedom of grace and we choose the imprisonment of self-hatred. We are, far too often, are harshest critics. How Satan loves to use that against us, keeping us from obeying God’s call and preventing us from resting easy in grace by preying on our weaknesses. It’s time to recognize, stark as it may seem that when you abuse yourself, you participate in the same kind of destruction that Satan wants for you (p. 73). And, just like the conversation with my daughter, this isn’t something fixed in two minutes, five, or an hour or more. It takes time, this gradual healing and move toward wholeness. Maybe that’s what we think. “My friend, go ahead and do what you have come for” (Matthew 26:50 NLT). Don’t take your shoes off and try on the 50 pairs of high-heeled shoes. Do not crawl underneath the clothes and skip from aisle to aisle. Do not pounce on the couches and jump on the cushions. Do not touch every ceramic, glass, crystal, porcelain, or other thoroughly breakable item you see on every shelf we pass. I tell her the truth: This behavior is unacceptable and I will discipline you if it continues. I love you. I want to help you learn to make better choices because of that love. I try to teach this to my daughter, beginning right there at a school cafeteria table. I try to teach this to myself. Sometimes we mess up, make mistakes, and sin. But we are saved, redeemed, transformed and wholly loved by the very God who created us and uniquely designed us for a calling and a purpose. 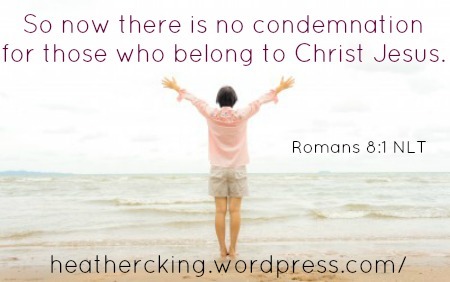 God doesn’t label us, abuse us, condemn us, shame us, or hate us. Yes, He loves us. That’s the truth. Tears…..beautiful Heather. A reminder I need every day.